1968: Dark Shadows' Josette jumped off Widows' Hill. 1984: Days of our Lives' Roman convinced Abe he was innocent. 1989: Another World featured the single women of Bay City. 1996: All My Children's Laurel was shot and killed. 1968: On Dark Shadows, Angelique (Lara Parker) tried to fool Barnabas (Jonathan Frid) using Josette's voice to go to Widows' Hill. Barnabas guessed what her plan was and left to save Josette. Josette climbed to Widows' Hill where Angelique showed her a vision of what she would become if she stayed with Barnabas. Barnabas arrived but Josette was frightened by him. He grabbed her to save her from the cliff but Josette pulled away and jumped to her death. 1971: Philip Carey and Anthony Geary guest starred on CBS primetime comedy All in the Family. In an episode titled "Judging Books by Covers," Archie mistakenly assumed Mike and Gloria's friend, Roger (Geary), was gay but it turned out his buddy, Steve (Carey), was actually gay instead. Read President Richard Nixon's reaction to the episode here. 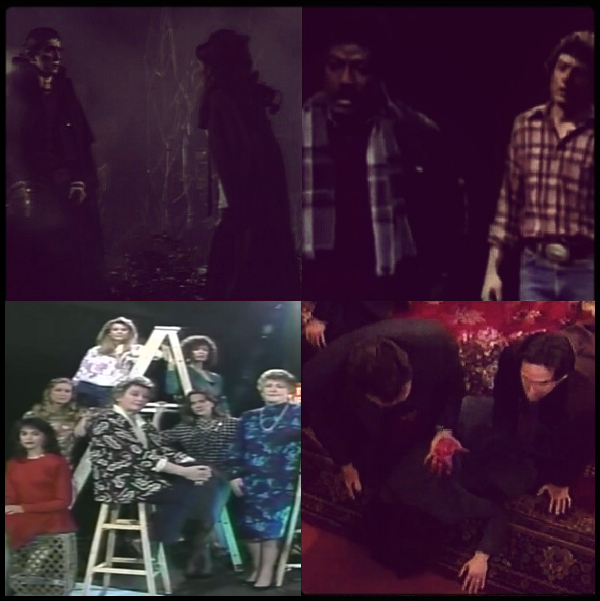 1973: On The Doctors, Dr. John Morrison (Patrick Horgan) tried to talk Cathy Ryker (Holly Peters) off a ledge, but the baby kidnapping nurse was so distraught she ended up falling to her death despite his best effort to save her. 1981: On Another World, Mac (Douglass Watson) and Rachel (Victoria Wyndham) told Mitch about Janice, St. Croix, and Matthew's paternity. 1984: On Days of our Lives, Abe (James Reynolds) found Roman (Wayne Northrop) and they faced off until Roman convinced Abe of his innocence. 1989: Another World kicked off a two-day "A Valentine to Singles" special. In Part 1, which featured the women of Bay City, Amanda Cory Fowler (Sandra Dee Robinsonn) tried to figure out what a single woman wants for her video dating project. 1989: On Dynasty, Jeff saved Sammy Jo (Heather Locklear) from the burning barn. 1990: The Bradys, a primetime soap featuring the sitcom and variety show family, premiered on CBS. In the first episode, Bobby (Mike Lookinland) became paralyzed after a racing accident. 1993: On Another World, Grant Harrison (Mark Pinter) married Vicky Hudson (Jensen Buchanan). 1994: FOX aired the 100th episode of Beverly Hills, 90210, titled "Scared Very Straight." David's (Brian Austin Green) amphetamines addiction was out of the control so he called Dylan for help. 1996: On All My Children, Laurel Banning Dillion (Felicity LaFortune) was shot and killed on the set of The Cutting Edge. 2005: Lyndsy Fonseca aired for the final time as Colleen Carlton on The Young and the Restless. 2005: On One Life to Live, Todd Manning (Roger Howarth) and Blair Cramer (Kassie DePaiva) talked over the walkie-talkies Margaret Cochran (Tari Signor) gave them. Margaret had Todd tied to a bed, while Blair was locked in the trunk of a car. 2007: On The Young and the Restless, Lauren (Tracey Bregman) shot and killed Sheila Carter (Michelle Stafford). Sheila, played by Kimberlin Brown for years on Y&R and The Bold and the Beautiful, had plastic surgery to look like Phyllis Summers Newman.